Beads, heads, and barbell eyes are designed to do three things, add weight to help the fly sink, improve visual enhancement and of course both, as well as influence how a fly swims – think jigging, retrieve, and water column. The most familiar of these additions are barbell eyes. SIDEBAR: Remarkably, the EPA has no clear directive on how to dispose of “household” lead products, which our fishing accouterments fall under. Even more astounding is that the EPA designates lead as hazardous and advises against its “household” use. Contradicting, “EPA’s regulations provide that wastes from households are not regulated as hazardous, and there are no limitations on the quantity of those wastes.” However, some state and even local governments as well as some states recognize their health responsibilities and require designated disposal sites which they manage. JS Stockard – barbell eyes. 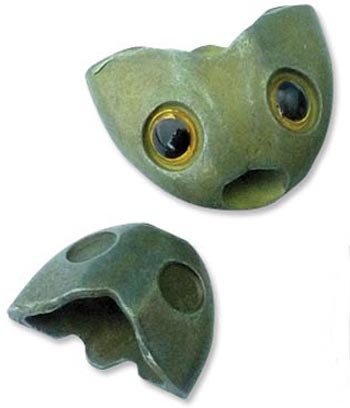 Beads, heads, and barbell eyes vary in size, and they are often linked to hook style like barbed or barbless, hook bend, and hook-eye profile. Sometimes de-barbing is necessary so the bead can clear the bend. Debarbing is also a better way to improve fish survival. Please go barbless. 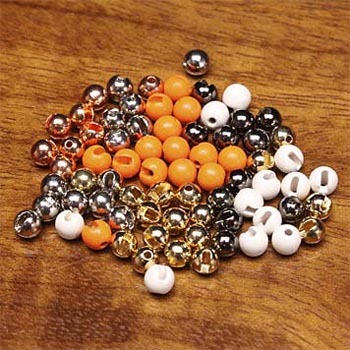 All metal beads have two different sized holes in them. The smaller hole is made to go against the eye of the hook. The larger hole faces backward so the weighted wire wrapped around the shank of the hook can be forced into the void. The larger space on the back of the bead aids in sliding the bead around the shank of the hook and makes it easier to put on – ‘countersinking.’” — James Spicer, Intheriffle, Inc.
Metal beads sink slow to medium speed – depend on other materials making up the fly pattern. Tungsten beads sink like a rock. Slotted tungsten beads – JS Stockard. Plastic beads are brightly colored and used as an attractor, spacers on articulated flies, and body parts of animals and bugs. Bead chain pull beads are light and used specifically as eyes on lightweight flies. Chain pulls tend to have sharp edges when separated to make a pair of eyes and can cut thread. 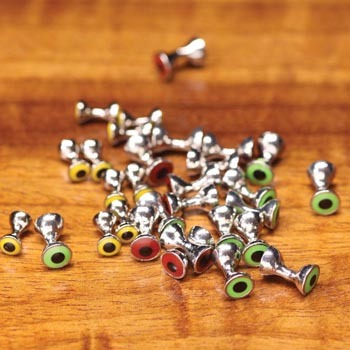 Brass beads are the most common type of beads used for fly tying – usually come in several different colors. 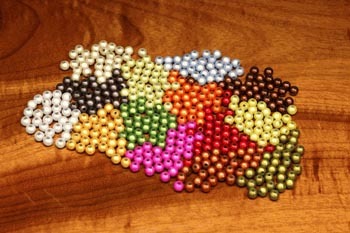 Tungsten beads are similar to brass beads in appearance, but much heavier (three times heavier depending on the brand). With no added weight in the leader, the fly has a better, more natural drift and presentation. Tungsten is also non-toxic and more expensive. 3D streamer beads – JS Stockard. Glass beads are available in to just about any color or shade of color you could imagine and are cheap. Clear glass beads imitate an air bubble on a fly and are often used to mimic mayfly and midge emergers. Glass is best beads for flies size 20 and smaller. Faceted (shaped) beads are available in both brass and tungsten and are not entirely round – flattened around the entire bead – used as heads (fish Skulls), big bugs like stoneflies, and bigger streamers. Featured Image Bead Head Cream Biot Midges by Curtis Fry – a commons image.